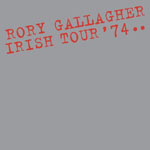 Share the post "Album review: RORY GALLAGHER – Irish Tour ’74 (Box set)"
As this package makes clear, Rory Gallagher’s Irish Tour of 1974 was set against a background of violence and strife in Ireland. Rory only ever wanted to play his music but, during this period, was one of the few performers to brave the troubles. Consequently in late-1973 he set out to play a series of gigs in Southern and more particularly Northern Ireland. ‘Irish Tour ’74′ has always been regarded as a classic live album release, edging the earlier ‘Live In Europe’. Now, to celebrate the 40th anniversary Donal Gallagher and Sony have assembled the definitive statement. The original release featured the best of two gigs at Cork City Hall on 3 and 5th of January 1974. Now we get the preceding Dublin (complete) and Belfast (highlights) gigs and the bonus ‘City Hall In Session’ which includes sound-check and studio material. Inevitably there is much song duplication but collectors will want to have this package for completism and no doubt some will pore over the relative merits of each gig, and 56 live tracks. A 16-page booklet also captures the spirit of the enterprise with archive photos, memorabilia and Donal Gallagher’s introduction plus a new essay by Gavin Martin largely based on Tony Palmer’s recollections. There’s also an interview reproduced from the US website ‘Shadowplays’ with engineer Robin Sylvester. If there is a criticism there isn’t any clarification of the Disc 7 studio stuff, although five tracks are “previously unreleased”. And – as far as the actual packaging goes – it’s a bit flaky with a stick-on track listing on the flimsy box almost an afterthought. The sound quality, though, has been improved and Rory’s raw energy and power is captured perfectly across the seven discs even if a little rough by modern standards. Tony Palmer’s documentary is an excellent inclusion – a great representation of the times and putting the gigs in context. (See archive review, below) It should be consumed first if you have not already seen it. Not long after these recordings Gallagher would find wider solo success in the USA and, in that sense, the gigs and the film are an essential record of a troubled world he, to some extent, left behind. 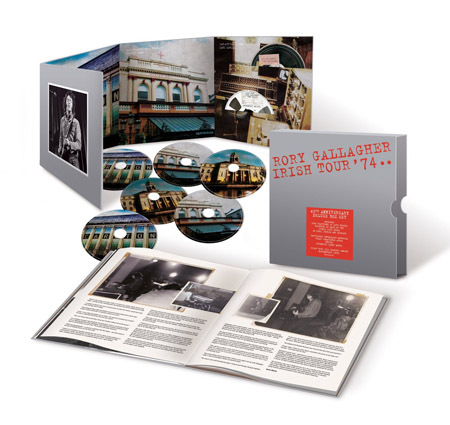 This entry was posted in ALBUM REVIEWS, ALBUM REVIEWS (Mobile), All Posts, Reissues and tagged album, blues rock, box set, documentary, Donal Gallagher, DVD, Gerry McAvoy, guitarist, Irish Tour '74, reissue, review, Rory Gallagher, Tony Palmer. Bookmark the permalink.